The installation begins by removing your existing roof all the way down to the decking. Once the old material is off, we then make any necessary repairs, install the shingle underlayment and accessories, and then finally apply the shingles. We diligently attempt to insure that your yard is kept as neat as possible during your roof installation. The area is cleared of any roofing debris and swept with a magnet in order to pick up any stray roofing nails. Last, we do a final inspection with you to ensure your satisfaction and to answer any questions you may have. We first apologize for the inconvenience but there will much construction noise during most phases of your roof installation, so please plan your schedule accordingly. We will need access to your roof via the driveway in most cases. Please park vehicles out of this area for the initial delivery of materials and later while work is in progress. If you have an outside power outlet we may need to use it during the installation. Remove loosely hanging items from the walls and move any items around the perimeter of the house that could be damaged by falling debris. Please keep children and pets away from work area. We will cover pools that are near the work area in addition to shrubs and plants that could be damaged. Check utility ventilation pipes to ensure that they have not dislodged during the installation. A roof is the first line of defense in protecting your home and family from the elements. As a full-service roofing company, our experienced staff at Legacy will not only professionally install a quality roof on your home; but we will also assist you in selecting the best materials that will prolong the life of your roof. We specialize in residential re-roofing and repair of damaged roofs. We will remove and replace your existing roof, or install a new roof on your new construction home. We also provide roofing repair and inspection when your roof has been damaged due to adverse weather or age. Whether it's an office, a church or an apartment building, our experts will restore your roof's integrity and protect your commercial property from the elements. Roofing is our specialty. We ensure your satisfaction and will get the job done in a timely fashion so you can get back to work as usual. Contact us today to see if our services are right for you! Storm damage from hail and wind is difficult to gauge from the ground. 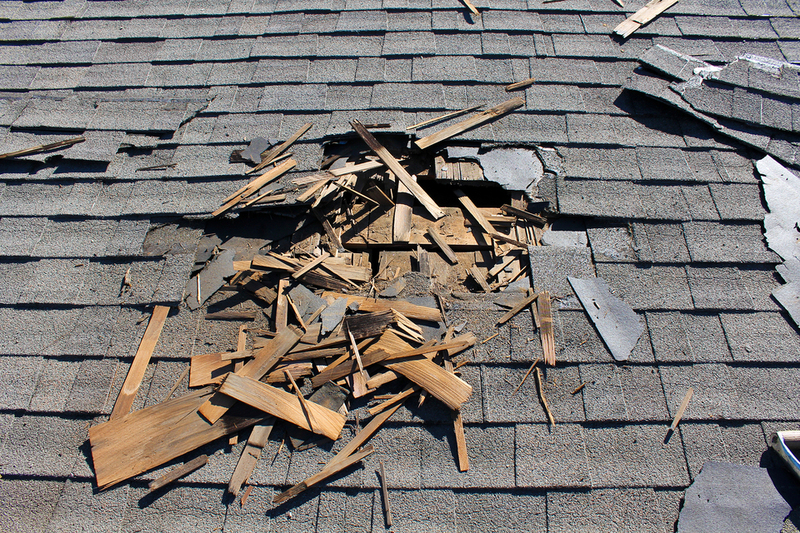 What may appears to homeowners as minor damage, such as one or two shingles missing, can compound into much more extensive roof damage down the road. Our representatives at Legacy Construction and Roofing are well trained and experienced at inspecting homes for storm damage. Countless times our representatives find storm damage that is missed by both homeowners and insurance adjusters. If your roof is leaking, it is important to prevent additional damages. We offer emergency storm damage roofing services, tarping, and cover up services, and will inspect your roof for FREE to ensure your roof is safe and sound. Hail, in most instances, unless it is golf ball sized or bigger, does not cause damaged roofs to leak immediately. Damage is often difficult to see from the ground; however, there are definitely tell-tale signs a homeowner can look for to determine if their roof may have suffered hail damage. The first thing you can check for is granule loss. This is noticeable around the gutter downspouts and the valleys of your roof. Although some granulation loss is normal, hail storm damage causes this problem to accelerate. Even pea-sized hail stones can cause significant granule loss, which will dramatically decrease the lifespan of your roof. Hail damage will void your manufacturer's warranty. Contact Legacy Construction and Roofing for a FREE roof inspection to determine if your roof has been compromised by hail damage. Evidence of wind damage can range from missing shingles to lifted shingles with broken glue seals. Asphalt shingles adhere to one another utilizing a strip of adhesive called a glue strip or sealant strip. When high winds break this seal, debris and dirt are blown into this glue area destroying the seal. These shingles will often not re-seal. In order to determine if any damage has occurred after a major windstorm, it is very important to have a qualified roofer inspect your roof. Legacy Construction and Roofing has worked in countless hurricane and wind storm areas, and our representatives are well qualified in identifying wind storm damage to homes. Just fill out the form below for a FREE roofing estimate or Storm Damage Inspection. To ensure promptness of service, please include location of property the estimate or inspection is needed.